Members will recall that Michael Salmon passed away in January and now it is our sad duty to report that his widow Jean has died last Friday 9 September in Jersey at the age of 89. 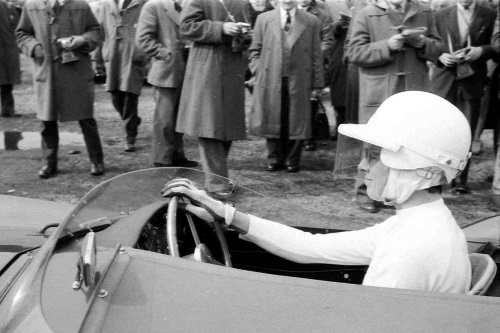 It was as Jean Bloxam that she became one of the most prominent British women racing drivers in the 1950s, particularly at the wheel of various Aston Martins. At the instigation of her then husband Roy, who entered her for the Ladies’ Race at Goodwood on Whit Monday 1954 without telling her, Jean was up against the likes of Nancy Mitchell, Pat Moss and Patsy Burt but nonetheless finished third in the handicap event. Later in the year she finished first and third in two races at Silverstone. The first DB2 was replaced by a 2.9 litre-engined version with which she attracted the attention of renowned Aston Martin Technical Director John Wyer after retiring from a race at Silverstone with engine failure while leading. While the second DB2 was undergoing an engine rebuild courtesy of Astons, Jean raced Roy’s ex-Colin Chapman Lotus-MG Mk 8 and an MG Magnette ZA with which she won the Ladies’ Race at Crystal Palace on August Bank Holiday Monday 1956. In 1957 she was invited to share one of the Fitzwilliam team MGAs in the Nurburgring 1000 Ks with Patsy Burt only for the car to retire shortly before the end of the second hour. The re-fettled DB2 brought her a win at Goodwood in a saloon car handicap, finishing eight seconds ahead of Patrick Lindsay’s new DB2/4 in the process. There was a further win with the DB2 at Silverstone in the Muskett Trophy whilst it was only on the last corner of the last lap that she was deprived of the lead in the Motor Sport Trophy by Henry Taylor’s Jaguar D-type, also at Silverstone. Jean also won the handicap division of the Arthur Bryant Memorial Trophy for David Brown Aston Martins and the post war category of the St John Horsfall Trophy, keeping Graham Whitehead’s full race DB3S at bay in doing so. At the end of the year Jean was awarded the Peter Bell Trophy for the most successful Aston Martin driver of 1957. In 1958 Jean acquired the very pretty Aston Martin DB3S coupe, previously David Brown’s road car and one of only three made, which became a familiar sight in sports car races around the UK, driven as it was to the circuits displaying Jean’s personalised number plate JB16. However, the drum brakes were the car’s Achilles heel so it was replaced for 1959 by the ex-works DB3S previously raced by Graham Whitehead. ‘Lofty’ England, then competition manager of Jaguar, suggested to Jean that she should try a D-type, initially for a proposed ladies’ race prior to the 1959 Le Mans 24 Hours which never came to pass through lack of entries. However, Lofty’s words had done the trick and the ex-Peter Blond red D-type (XKD518) was acquired for 1960. Tragedy struck when Roy crashed fatally at Goodwood on Whit Monday 1961 in his Lister-Jaguar and Jean decided to stop racing. However, she remained involved with cars and the sport, continuing as a director of the Gerrards Cross Motor Company with Michael Salmon whom she later married. In his time as BRDC President Innes Ireland was astonished to discover that Jean was not already a Member which was soon rectified, initially by her election as an Honorary Member in 1993, proposed by Sir Stirling Moss and seconded by Lofty England, and in 2001 Jean became a Full Member. She is on record as saying that becoming a BRDC Member was the proudest moment of her life. To her family and many friends the BRDC offers its sincere condolences. Jean’s funeral will take place at 12 noon on Friday 23 September at Holy Trinity Church in Jersey.